Available in 25 ml (approximately 10 cartridge refills) and 250 ml (approximately 100 cartridge refills) bottles. 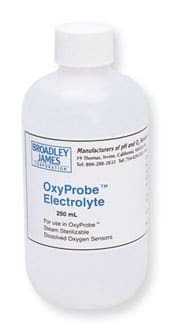 In critical biotech applications the electrolyte should be changed after every run to yield accurate results. The shelf life of this solution is approximately 2 years. Lot numbers and expiration dates are clearly marked on each bottle for tracking.